Unfortunately I still do not have access to the CDIAC server showing the information on the USHCN sites in Arkansas, so as I discussed last time I have obtained the information from the surface stations site and then downloaded the various station temperatures from the GISS site. 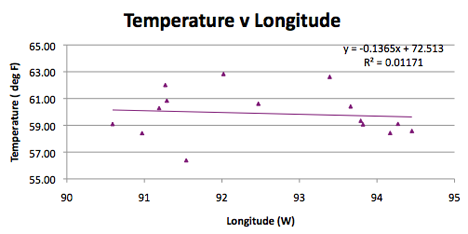 Unfortunately this does not include the TOBS data, only that homogenized before being published. There are some problems with that homogenization, which really requires both sets of data to illustrate, but I’ll leave that for now, just to do an initial review of the Arkansas initial data set, and to look at the population data. There are only 15 USHCN stations, and one GISS station (Fort Smith) on the list, so that the initial work was not that demanding. 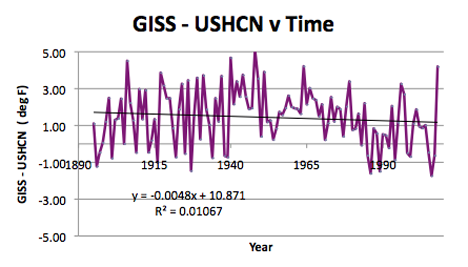 The shape of the curve seems to show an increasing difference through about 1948, and then a decline since that time. Given the switch in some series to only using data after 1948 this is slightly curious. 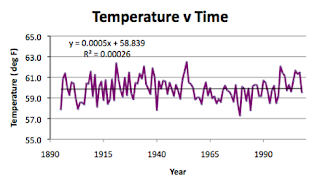 Turning to the overall change in temperature of the state over the century, and now using the homogenized data (hence the purple) rather than the TOBS raw data, the line still does not show very much of an increase over the past century. 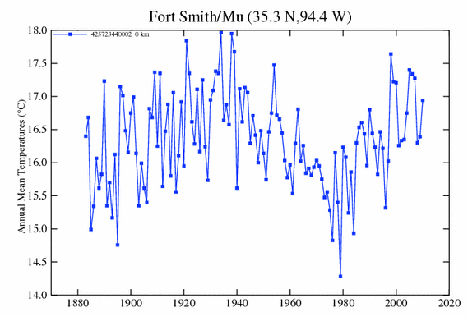 Average temperature change in Arkansas over the past 115 years. 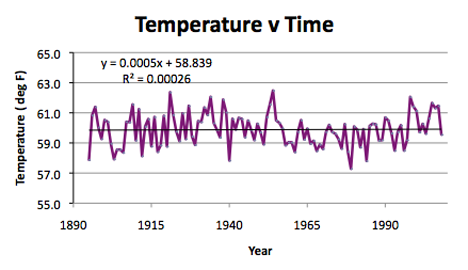 The temperature has been increasing at the rate of some 0.05 deg F per century, which is not a lot. 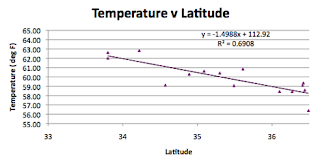 Arkansas is some 260 miles by 240 miles in size running from roughly 89.6 deg to 94.7 deg W in Longitude, and 33 deg to 36.5 deg N in Latitude. 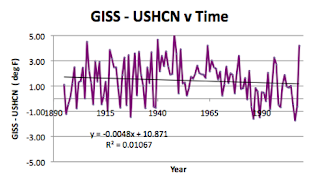 The highest point is at 839 m, and the lowest is at 16.7 m, with the average elevation of the state being at 198 m. The average USHCN station is at 176 m, and the GISS station is at 134 m.
Checking the populations, that of Rohwer is too small for citi-data, so I used zip area code to find 77. 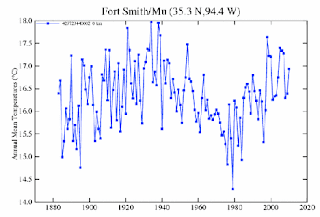 Fort Smith (the site of the GISS station) has the largest population of the stations. Looking at the effects of the geography on the temperatures, beginning with the effect of Latitude. 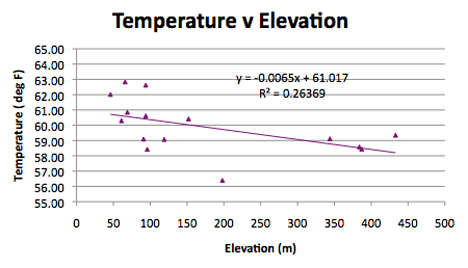 As has been discussed before, any correlation is likely an artifact reflecting changes in elevation. 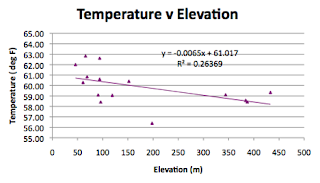 When one looks at the effect of population, using the homogenized data, rather than the TOBS data, then there is sensibly no effect of population, in fact such correlation as exists is negative. 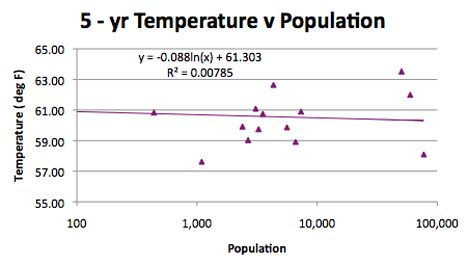 Effect of population on temperature in Arkansas after the data has been homogenized.